Marinara sauce is a great basic red sauce to have on hand. You can use it with any pasta shape, layered in lasagna, as part of your chicken parmesan, spooned over slices of polenta, and even as the sauce on pizza. And although marinara sauce is readily available in jars in the grocery store, it is so simple to make you'll never go back to store-bought. Homemade is also lower in sodium and free of preservatives, making it a healthier choice. Feel free to double the recipe and freeze portions for later use. Just let the sauce cool before pouring into small containers and placing in the freezer. Thaw in the microwave or in a pan on the stove before using. 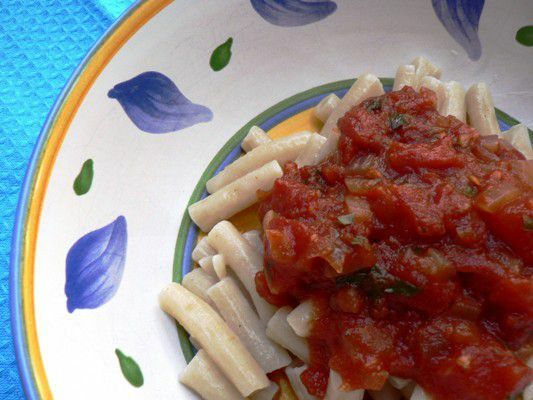 This delicious and fresh-tasting marinara sauce benefits from the addition of fresh herbs as well as balsamic vinegar, which imparts a rich tanginess and a pleasant but unexpected flavor. Heat oil in a large pan or skillet. Sauté garlic and onion over low heat until softened, about 5 minutes, making sure the garlic doesn't brown. Add tomatoes, balsamic vinegar, and tomato paste. Bring to a boil then reduce the heat to a simmer. Add chopped herbs and simmer uncovered for 15 minutes.